Easy Elvis Cupcakes (3 Variations)- No special flours needed! Double chocolate chip mini cupcakes using cashew butter with my Whipped Ganache Frosting. Add nut butter, eggs, banana, baking soda, vinegar, sweetener, cocoa powder, vanilla, coffee and coconut milk to a medium bowl. Blend well with whisk or electric mixer. Taste for sweetness and adjust if needed. 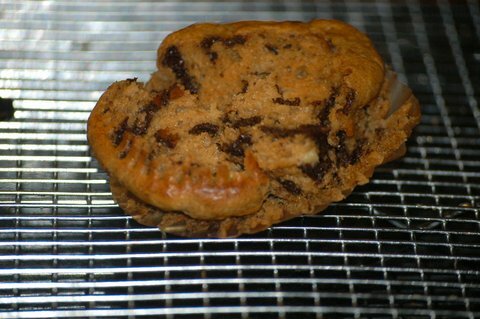 Using large scoop (1/4 cup), divide batter into 7 cupcake liners (using scant full large scoop). Bake for 15-17 minutes. DO NOT OVER BAKE! Use 1-1/2 tablespoon scoop and scoop batter into mini cupcake liners. Carb Count: 7 net carbs each cupcake **Note: If using unsweetened applesauce, there will be 2 LESS net carbs per cupcake. Remove from double boiler. While warm, pour over cupcakes. Add chocolate chips and cream to microwave safe bowl. Microwave for 45 seconds and then stir. Continue to microwave in 30 second intervals until chocolate is melted and ganache has formed. There will be extra Ganache. Place Ganache in refrigerator and allow to chill for 30-60 minutes. Whip with beaters until soft to stiff peaks form. The recipe made 30 minis using the 1.5 tbsp scoop! I doubled the recipe and make 5 dozen! When I think of Elvis, I think of my Grandma Rogers who still to this day loves Elvis! I also think of peanut butter and banana sandwiches! Yummy! I have always loved peanut butter and I really didn’t mind the switch 6 or 7 years ago to natural peanut butter from Jiff, which is what I was raised on. Yes, you have to stir it but if you get one of those clever Peanut Butter Stirrers (I highly recommend purchasing one), it will save you the mess of cleaning up spilled oil which is a little harder than cleaning up spilled milk! 😉 These cupcakes are SO EASY!! They are inspired by the first bread I made after going grain free over 15 months ago. Secret ingredient, peanut butter (OR ANY NUT BUTTER)! And an Elvis cupcake wouldn’t scream ELVIS without bananas! In the past year, I haven’t eaten many bananas because they are very high in sugar but I have managed to add just enough for flavor in my Banana-Nut Scones (in cookbook) as well as these cupcakes to give you a little bit of banana flavor without all of the sugar! This is a peanut butter-banana cupcake and not a sandwich which Elvis was famous for but perhaps he wouldn’t have left this world so early if he had of laid off the bread anyway. Just a thought. Another reason this recipe is so easy is because you don’t need any special flours. I use almond flour and coconut flour in all of my other recipe creations but for those just starting the grain and sugar-free lifestyle, this gives you just a taste of something sweet without having to rush to look for any of the specialty flours. Also, the directions are as easy as peanut butter pie…. add all ingredients to a bowl and mix. DONE! I do like to pour the vinegar over the baking soda to watch the bubbles but that is not necessary but I like the amusement 😉 These cupcakes are very moist as long as you don’t over bake. If your oven tends to run hot, take them out a few minutes early. Also, if you want to frost them, try them dipped in my Chocolate Ganache or Whipped Chocolate Ganache or just frost them with a little peanut butter sweetened with a smidgen of Stevia. I love to experiment and you never know what taste good until you try it. I also made a batch and added 2 tsp of cinnamon and 1/2 cup chopped pecans to #1’s recipe to create sort of banana-nut muffin. I thought it tasted great even with a little peanut butter flavor so really there are 4 variations you could try. Want some bacon with your chocolate?? 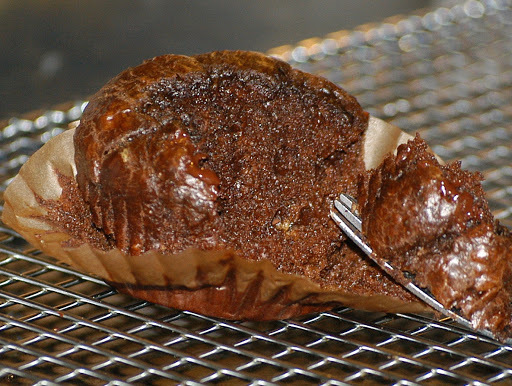 Add 2 pieces of cooked, crumbled bacon to the Double-Chocolate Cupcake for an extra surprise! Elvis (and grandma) would be proud! UPDATE: My new FAVORITE nut-butter to use is Cashew Butter! It is absolutely delicious! **Substitutions: You could also substitute natural almond butter for the peanut butter if you like (or need to). I chose peanut butter because I LOVE it as well as it is half the price of natural almond butter. ** Another substitution would be 1/3 cup unsweetened applesauce for the banana. This is a great option for lower carbs and if you don’t like bananas. I hope you enjoy this recipe and all of it’s variations. Happy Eating! Preheat oven to 350 degrees F. Add all ingredients to a medium bowl and blend well with whisk. Taste for sweetness and adjust the sweetness if needed to suite your taste. 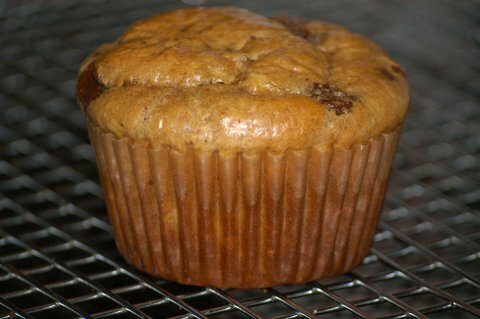 Using a large scoop (1/4 cup), divide batter into 7 cupcake liners (using scant full large scoop). Bake for 15-17 minutes. DO NOT OVER BAKE! Follow recipe exactly (Add some chopped nuts if you like). Use small Scoop and portion out cookies on parchment lined cookie sheet (or get one of these handy silicone liners). With buttered (or oiled) hand, flatten cookies slightly. Bake 10- 12 minutes. Do not overbake! 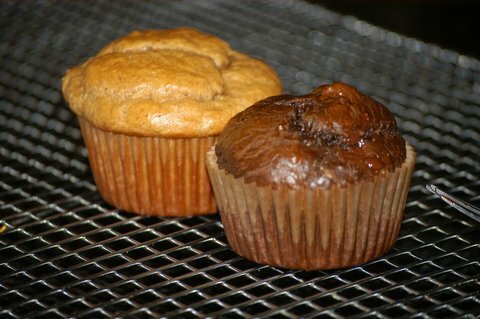 Baking the double chocolate cupcakes right now– mine had VERY thick batter… Maybe there wasn't enough oil in my natural peanut butter? It seems to separate and then makes my recipes inconsistent– some too much oil, some not enough. I think I'm off to amazon to buy a peanut butter stirrer! ;). Ps: I used apple sauce and melted cacao! @dallasmamaof2, I haven't had that problem. Be sure natural pb is stirred well. I have used 2 different brands the 4 or 5 times I have made them and they blended well, I didn't even use a mixer. Definitely get the PB stirrer! http://astore.amazon.com/satisfyingeat-20/detail/B000A3I3BA The batter separating also could come from the melted cacoa. Try using unsweetened cocoa powder next time. Hope this helps! @EmilyB, glad you and the kids loved these easy treats! Instead of Kal Pure Stevia can you use splenda? Hi, Melissa! I just wanted to write and tell you how much I love this recipe! They are so delicious and moist. I made them again over the weekend and used sunflower seed butter instead of the peanut butter and they turned dark green! They tasted delicious, but were green! It may be fun to do this over Christmas or St Patty’s day without using food coloring! Thanks for your wonderful recipes. I love reading your blog about the boys too!! Hope you’re feeling better!! Just wanted to mention that if you’ll store your peanut butter jar upside down, you’ll never have to stir it. 🙂 Thanks for the yummy recipe! What other kind of sweetener can you use? Honey, maple syrup? What would the measurements be? Kerry, you can use any sweetner. I would recommend any of those. Add a little and taste. I know this is a broad statement but there are so many different sweeteners out there and everyone’s pallet is a little differnt! Hope this helps! Whatever sweetner you use, please let me know what you use and how much! I used a 1/3 cup of maple syrup. There was more batter, so I made more cupcakes. They are baking right now, I will let you know how they turn out. They came out perfect. Thank you for the recipe. These are the best cupcakes I have ever had. Seriously. I used maple almond butter and enjoy life chocolate chips. Oh my, sinful! Oh, and I made 9 instead of 7. I made a batch of the Chocolate Chip-Banana cupcakes (I substituted Almond Butter for the peanut butter) on the weekend and they were a huge hit. I’ll be making another batch tonight to take with me on a white-water rafting day trip on Friday. Do you know how these freeze? I need to make some for my son for when his classmates get cupcakes for birthdays, and they will be freezing them. I am not sure how they will be defrosting them, probably in the microwave. Just looking for some advice because he loves these. Glad you enjoyed them Erin! So easy!! !